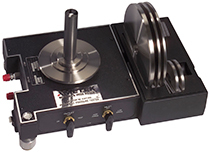 The RK floating ball type pneumatic dead weight tester is engineered to offer user-friendly, safe operation. The easy-to-use primary standard provides reliable and accurate pressure measurement in the field, or in a lab. Featuring a self-regulating design, that allows automatic stabilization of weights, eliminating the need to adjust input pressure. Local gravity and standard gravity (980.665 gals) versions available.